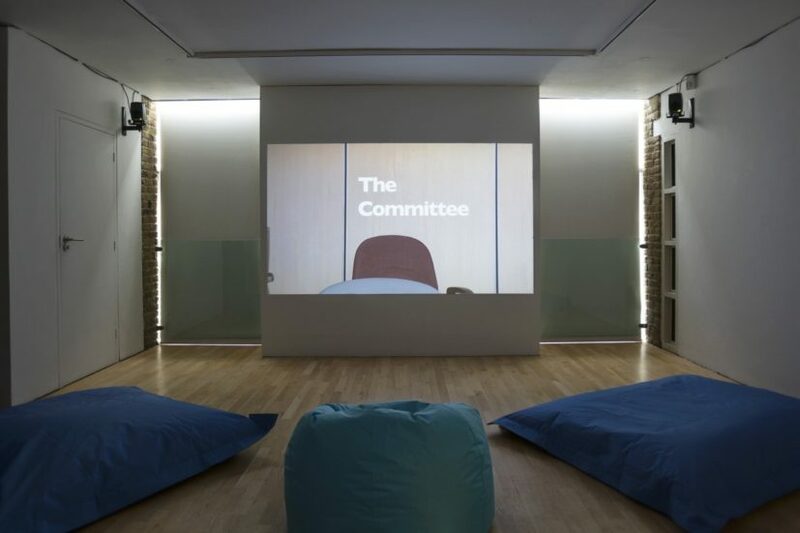 Pilvi Takala, detail of The Committee project, 2013-2017, Pump House Gallery, London. Photo: Eoin Carey. Pilvi Takala, The Committee, 2014. Courtesy: © the artist, Courtesy of Carlos/Ishikawa, London. Photo: Eoin Carey. 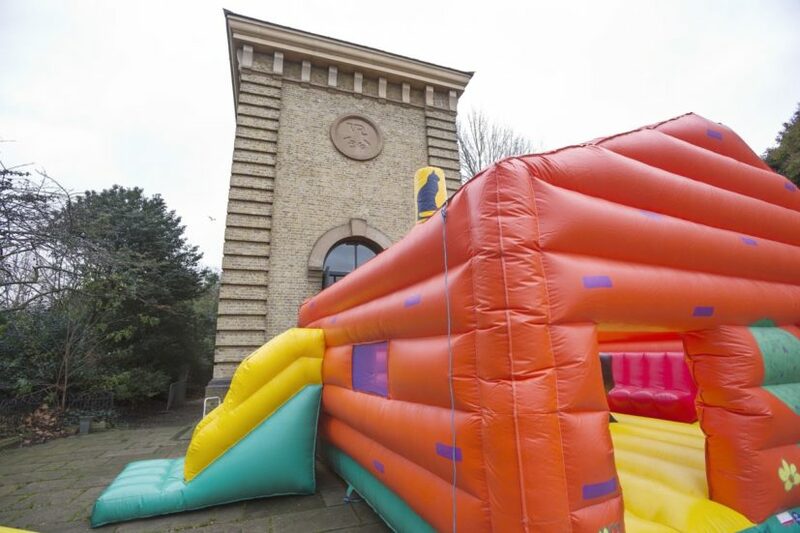 If the weather is good, young visitors to the Pump House Gallery in Battersea can be found jumping around on an unusual bouncy house. 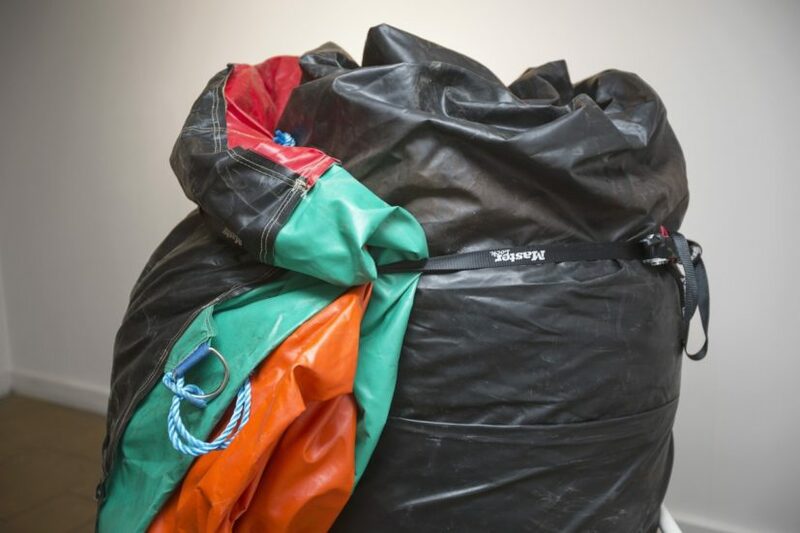 It is part of Pilvi Takala’s exhibition The Committee and was designed by a group of eleven 8-12 year olds from Eastside and Tredegar’s U13 Youth Club in Bow. 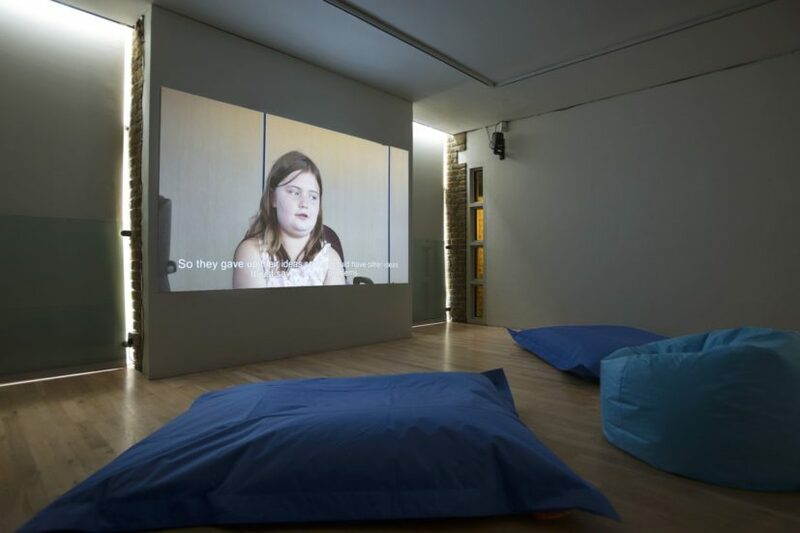 In 2013 Takala was awarded the Emdash Award at Frieze Art Fair and decided to give the prize money, £7,000 after development costs, to this group of children to spend as they liked. A video allows us to explore the decision-making process through the eyes of these young people. 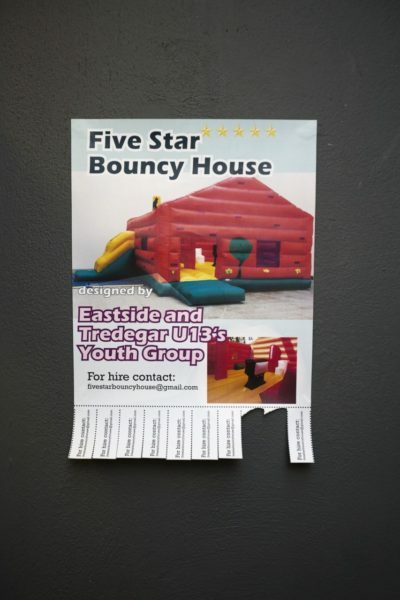 After much debate, they decided to design and commission a custom-made Five Star Bouncy House. Ingeniously, it was intended to then be rented out to raise funds for the youth club. Sadly, however, the club has since closed as the local housing association sold the site for redevelopment. The context of winning a prize at an art fair prompted Takala to think about value and how it is defined within the art world but by making a work that went beyond its confines. The main interest of Takala’s practice is social behaviour and the way we create rules when we live together. Working with children, a powerless group of people without pre-existing conventions on how to make decisions, seemed interesting to her. The artist put them in a situation where they would have to express their values and negotiate them amongst themselves to find a fair way to make a decision. In fact, the children seemed to naturally strive for consensus. The Committee grew out of an earlier video work Players, 2010 in which Takala explored social codes around spending money in the unusual setting on a group of expat online poker champions living in Thailand. They treat money as a game and create their own rules, such as playing ‘rock, paper, scissors’ to decide who picks up a tab. Both of these films depart from Takala’s more familiar practice of using her own body in her work. In a seminal early work Event on Garnet Hill, 2004, she donned the green uniform of a Glasgow Catholic School and loitered outside the school gates, causing low-level disturbance. In her most well-known video Real Snow White, 2009 she dresses as Disney’s Snow White and stands outside Disneyland Paris where security guards try to remove her and prevent children from taking photographs with her, as she is not the ‘real’ Snow White. In The Trainee, 2008 Takala posed as an intern at Deloitte’s and sat around doing nothing and staring into space or riding up and down in the lift, to a flurry of perplexed and irritated emails from staff members. 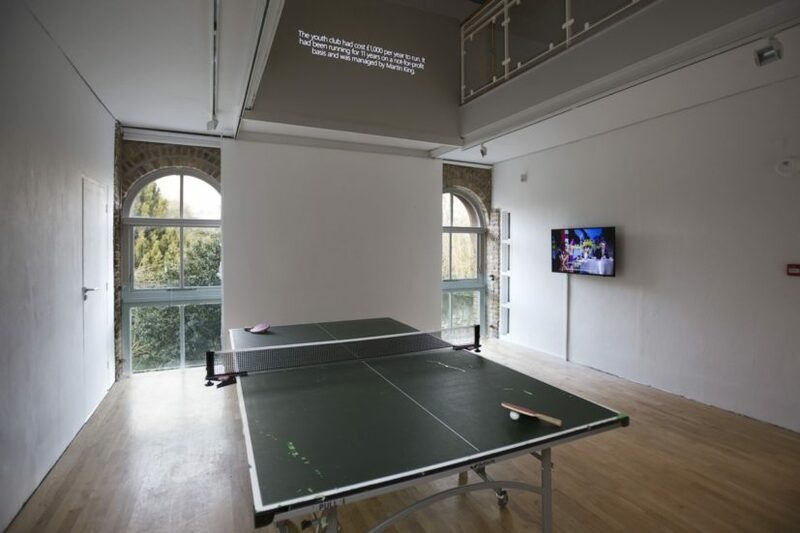 Her latest exploration of the pathology of office culture is The Stroker (Personnel Touch), 2017, a new project carried out in London in January. 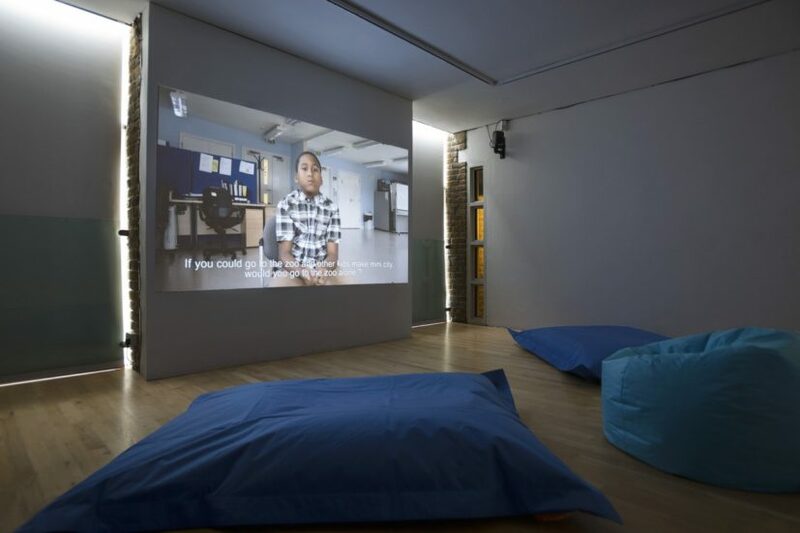 Takala spent a week at Second Home, a trendy working space off Brick Lane. The artist became Nina, an entrepreneur using touch as a therapeutic tool in the work place. ‘Nina’ would attempt to stroke people as they passed her in the corridors, noting their responses, from the horrified to the friendly. In total Takala recorded 22 distinct gestures of the ‘touchees’ and archived them to create material for a performance with a dance artist. Takala has built up an intriguing body of work over the last twelve years that probes how we function as a society. Born in Helsinki in 1980, Takala is based in Berlin and represented by London’s Carlos/Ishikawa. She took her BA and MA at the Academy of Fine Arts, Helsinki and was in residence at the Rijksakademie 2009-2010. She came to international attention in 2005 at the Istanbul Biennial and has shown widely at exhibitions and film festivals since then. 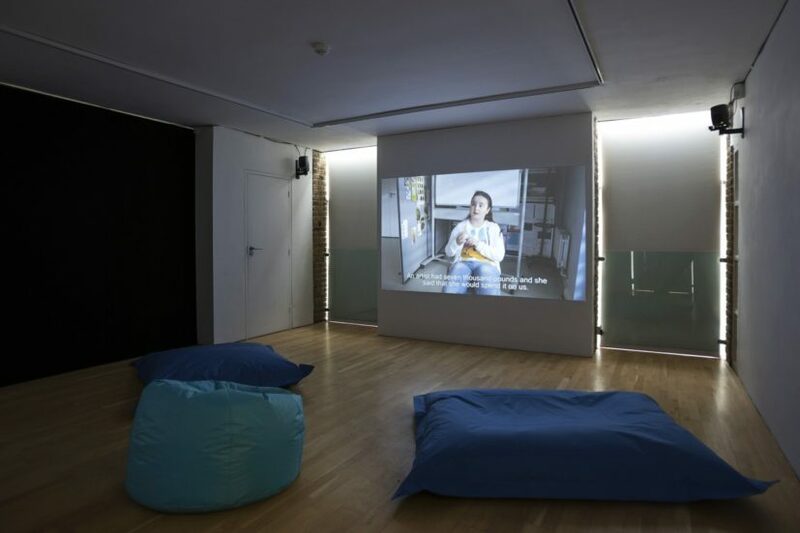 Her work has been seen regularly in the UK, including solo shows at CCA in Glasgow in 2016, Frieze Art Fair and Gasworks in 2013 and Site Gallery, Sheffield in 2012. 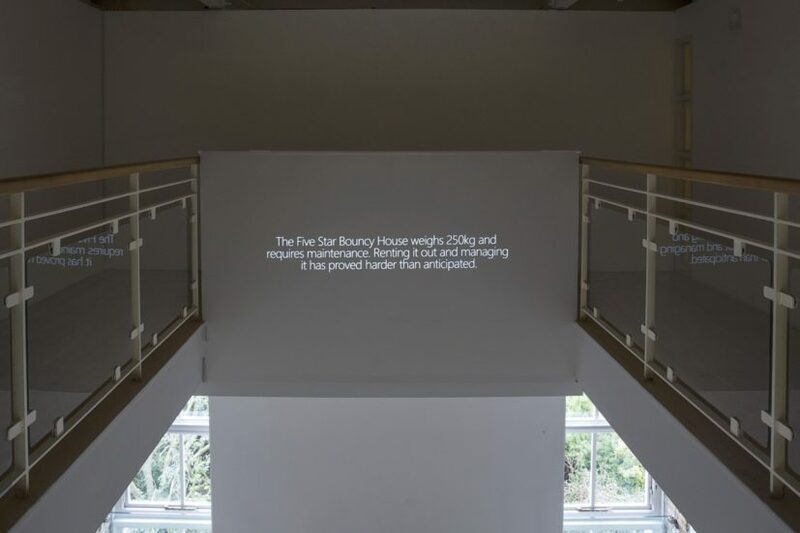 Recent international solo shows include Kunsthal Aarhus in 2016, Helsinki Contemporary in 2015, Tartu Art Museum in 2014 and Bonniers Konsthall in 2013.